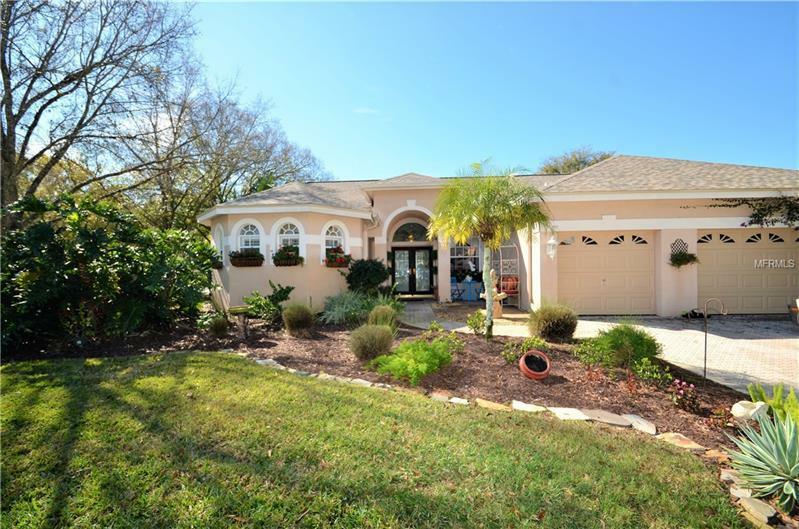 Fabulous 4-bedroom, 3-bathroom executive pool home in the Highgate subdivision of Lansbrook! Upon entering this lovely home, you are greeted by the custom etched glass front door, the open concept layout as well as how light and bright it is. There is beautiful wood flooring throughout the home. The stunning kitchen features all Whirlpool stainless steel appliances, granite counter tops and a great breakfast bar. The spacious family room has large glass slider doors giving direct access to the beautiful screened in lanai and pool area. The spacious outdoor patio has plenty of space to sunbath or sit in the shade. The large glass sliders in family/living area allow plenty of natural light to flow into the home. Home boasts a triple split floor plan with extremely spacious bedrooms with lots closets and storage. Brand new roof in 2018! The large quarter acre corner lot is complimented with lush landscaping and a stunning pavered driveway! Conveniently located near A-rated schools, shopping, restaurants, beaches, hospitals, parks, playgrounds, basketball, soccer fields, golf courses, and boat ramps! This home will not last long! Call today for your private tour.